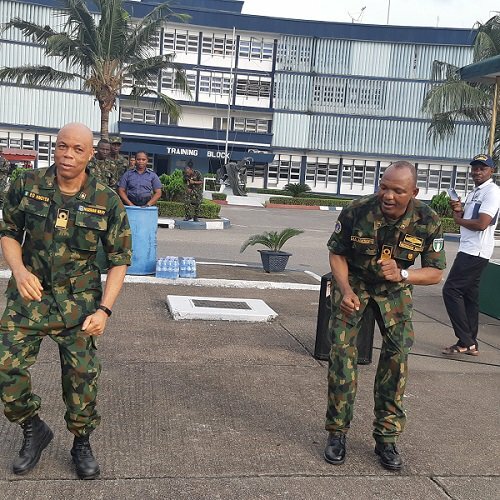 The Nigerian Navy said its officers and men are in physically fit to be deployed for any operation around the country. The Flag Officer Commanding Naval Training Command Rear Admiral Stanford Enoch, made the assertion after a 10 kilometre route march in which over 1000 personnel of the Command in Lagos area participated. Admiral Enoch who was represented by the Command Ashore and Training Officer of the Naval Training Command (NAVTRAC) Commodore Adesola Adesope said the essence of the march is ensure the physical fitness of troops of the command. The FOC also tasked its personnel on physical fitness, urging them to take advantage of every opportunity presented by the force to ensure fitness and be ready for other deployments within the service. He said that in line with the duties of the force, the route march is routine and personnel are enjoined to regularly engage in the route march to ensure they are ready for deployment at all times. He said that all personnel were expected to be physically fit, commending the personnel for their participation in the route march, adding that no officer dropped out of the March, and that it was a testament that the objective of the annual medical test and weekly physical exercise conducted on personnel by the command had been achieved. He said: “Our objective has been met, and I want to charge every one of us to take advantage of the every opportunity that we have to exercise physically.